How do I organize my ePortfolio pages as a student? You can organize your ePortfolio pages within your sections. 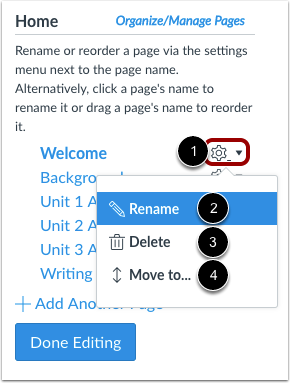 You can also rename, reorder, and move pages. Click the Organize/Manage Pages link. 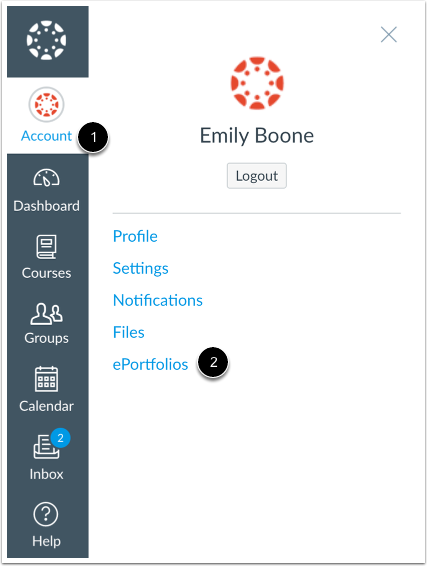 You can organize your ePortfolio pages in the menu. 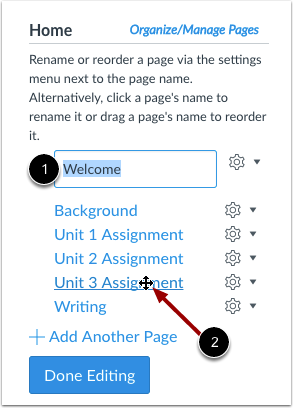 To rename a page, click the name of the page and type the new name in the field . To reorder a page, hover over the page name and wait for the cross arrows to appear . Click and drag the page to the new location in your section organization. 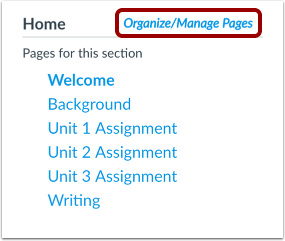 You can also use the Settings icon to organize ePortfolio pages. To view your options, click the Settings icon . To rename a page, click the Rename link . To delete a page, click the Delete link . To move a page, click the Move To... link . 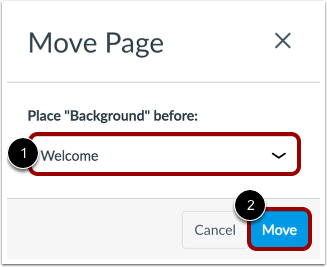 In the page drop-down menu , select the page that should come after the page you are moving. Click the Move button . Click the Done Editing button. Previous Topic:How do I create a new ePortfolio section as a student? Next Topic:How do I edit the default page in my ePortfolio section as a student? Table of Contents > ePortfolios > How do I organize my ePortfolio pages as a student?